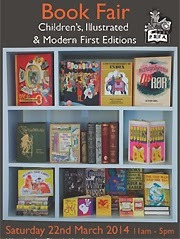 Specialising in Modern Firsts, Illustrated Books and Children's literature. No books on trains, boats, planes or Arctic Exploration...not this time. Be there or be square. 11AM- 5PM Saturday 22rd March. 380 Kensington High Street London W14.